The Outbreak of the First World War in 1914, followed by the worldwide economic crisis in 1931 seemed to sound the death-knell for the Sovereign. 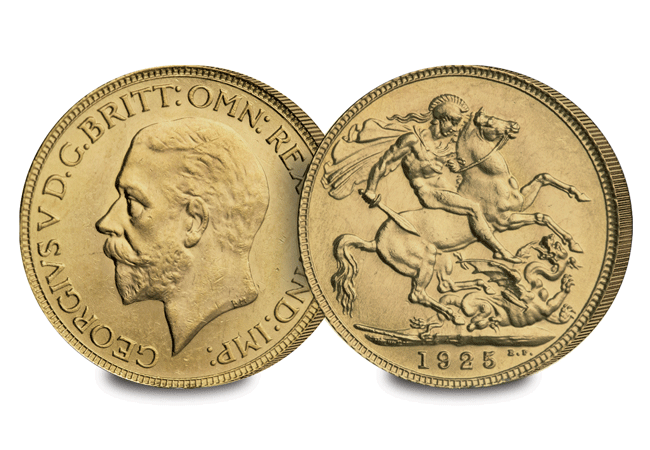 Gold Sovereigns were struck annually until 1915, but production dropped dramatically in 1914 and the majority of the 20 million minted in 1915 were for overseas use. As part of the emergency measures put in place upon the Outbreak of the First World War, specie payments were suspended and Treasury notes replaced gold. Gold coins disappeared from circulation but they continued to be minted for overseas bullion transactions. 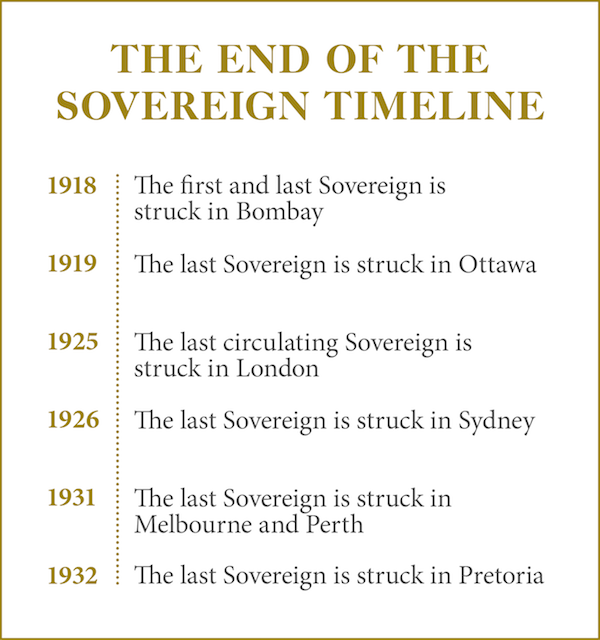 Sovereigns were struck in 1916 and a small amount in 1917, but no more circulating Sovereigns were minted in London, except for a consignment for overseas use in 1925. The overseas branch mints still struck considerable quantities of Sovereigns. Sovereign production continued after the war, but in much smaller numbers. Despite this, another two branch mints were opened. One in Bombay in 1918, which struck Sovereigns for just one year only. The other was opened in South Africa in 1923. By 1926, only three branch mints were still operating – Perth, Melbourne and Pretoria. However, the worldwide economic crisis in 1931 signalled the end of these remaining branch mints, Britain left the Gold standard and the last Sovereigns were struck in Pretoria in 1932. This appeared to be the end of the Sovereign. But all was not as it seemed. Would the Sovereign be revived again? To mark the Bicentenary of the “modern” Gold Sovereign in 2017, The Royal Mint have just released a brand new Gold Proof Sovereignreprising Benedetto Pistrucci’s original engraving from 1817. Is there a gold sovereign for 2017?